May you be surprised at finding beauty in the midst of ruin. 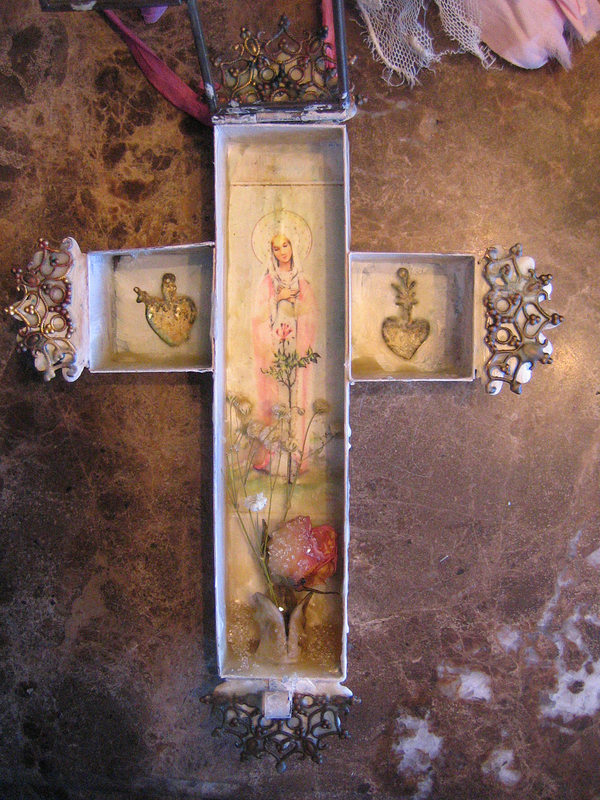 I created this nicho using a vintage Italian Holy card of a Madonna in adoration of a rose that appears to have sprung up in the midst of nothing. I couldn't keep from thinking about how many times I have been surprised at finding beauty in the midst of what might have been viewed as ruins or despair. I agree - there are so many wonderful things just hidden in a pile somewhere - i always ache for the families of beautiful old sepia photos at the Sally Anne or other jumble sale, where are their owners, I so love them, but someone knows them! I love her face so soft - would love to see her closer.. lovely piece you made and gave her new life..
Hi Janie, I have to confess...I snooped through you whole blog, and looked at all of your are work...I had such a fun, fun time. You are so very talented. And creative. I love your nicho and find it very similar to some of my art. I recently retired from teaching and am now creating art almost full-time...it is so glorious, no? I'll be sure to check back to your delightful site often! I don't see a comment box for the 8th, so will post for today on yesterday's post. This is a beautiful piece and I am curious about the process you used to create it. Lovely music, too. A beautiful thought ~ the rose blooming in the middle of nothing, as if the universe saw a void and wanted to fill it. I love your nicho. It is precious an an inspiring tribute. thank you for your beautiful heart, your eye for sacred, your willingness to create.